Kentucky U.S. Senator Rand Paul says he hopes speakers at the Republican National Convention in Cleveland reach out to the nation’s immigrants. The Bowling Green Republican says he disagrees with statements made by his party’s presumptive presidential candidate, Donald Trump, about banning all Muslim immigrants from entering the country. “I don’t think there should be a religious test for entering into the U.S.,” Sen. Paul said. “But I don’t think we should stick our head in the sand and say, 'Oh well, let's just have open borders--none of these people are coming to attack us.'" Paul said European Union countries have suffered a spate of terrorist attacks recently in part due to the group’s open borders policy. Paul is not attending his party’s convention in Cleveland, saying that he’ll instead focus on his Senate reelection effort. He’s holding a series of town hall meetings across the state this week. Paul is facing Democratic nominee Jim Gray, the mayor of Lexington. Paul ran unsuccessfully for the Republican nomination for president and dropped out of the race following a poor showing at the Iowa caucus. Following Melania Trump's speech Monday night at the Republican National Convention, several social media users pointed out a section that was startlingly similar to one the country has heard before — it came from current first lady Michelle Obama at the Democratic National Convention in 2008. It is, of course, common for political speeches to be filled with platitudes like both women used — values, morals, getting what you want in life. But comparing the two speeches, the overlap amounts to more than passing similarity of a few phrases. The section of Trump's in question is one minute long, and about half of the words in it are the same as Obama's. The parts that are the same have been bolded by NPR below. The videos begin playing at the comments that are in question. 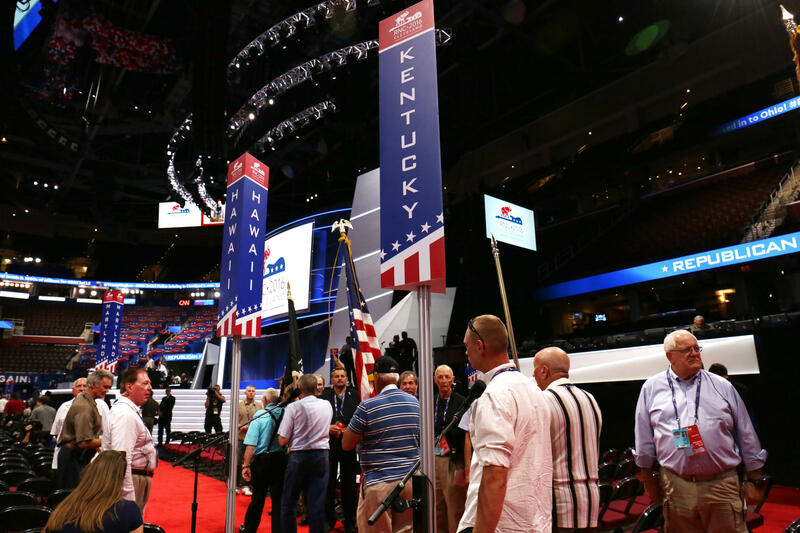 Forty-six delegates and 43 alternate delegates from Kentucky will be among the crowd at next week’s Republican national convention in Cleveland. Donald Trump is expected to formally accept the GOP nomination for president at the event. The real estate mogul Trump won 79 of Kentucky’s 120 counties when state Republicans held their presidential caucus in March, but like elsewhere around the country, not every Kentuckian is enthusiastically supporting Trump. Owensboro businessman J. Todd Inman is going to the convention as a delegate from Kentucky. Inman says Trump wasn’t his first choice, or his second for that matter, but his allegiance now stands with the billionaire businessman. Conventions give candidates a second chance to make a first impression, even candidates who have been covered by the media as obsessively as Donald Trump. 1. Will the Cleveland Convention stick to a script? Successful conventions drive home a message relentlessly, with every speech, video and testimonial designed to highlight the strengths of the candidate and minimize his weaknesses. Trump has shown that he is allergic to this kind of discipline. Even the roll out of his vice presidential pick was shambolic and off message. Reince Priebus, the Republican National Committee chairman, told the Washington Post that one goal of the convention is to make Trump more “likable.” After all, electing a president is more about “Like” Q than IQ. State Sen. Ralph Alvarado will deliver a speech at the Republican National Convention this week in Cleveland. Alvarado, a Republican from Winchester and a physician, is the first Hispanic elected to the state legislature. “I plan to talk about my story as a public servant striving to make my state and nation a land of opportunity for anyone willing to work hard and persevere,” he said in the statement. Alvarado was elected in 2014, unseating Senate Minority Floor Leader R.J. Palmer, a Democrat. Over his first two legislative sessions, he has pushed for medical review panels and successfully shepherded a new law that creates an appeals process for medical providers who have Medicaid claims denied by managed care organizations (MCOs).